Should you purchase a Maltese teacup? are the perfect pet for you and your family. You may be considering getting teacup Maltese puppies. They're so small, cute, and loveable; who wouldn't want one of these tiny Maltese dogs? Maltese tiny teacups may have stolen your heart, but before you make that big decision to purchase one, take a look at the traits of these tiny dogs. Fragile - since teacup Maltese dogs are bred to be tiny, they are also very fragile and can be easily hurt or even killed. Poor Health - common issues with Maltese teacup puppies are crowded teeth, fragile bones, low blood sugar, and weak internal organs. Difficult to Potty Train - Maltese tiny teacups come with an even tinier bladder. The smaller the dog, the harder they are to potty train. Picky Eater - many Maltese teacups have digestive and breathing problems that make them very sensitive to the food they eat. Expensive - teacup Maltese are usually hundreds of dollars more than an equally cute and healthier standard sized Maltese. 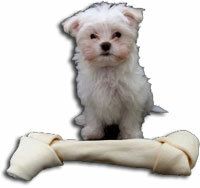 Now that you know more about teacup Maltese dogs you can make an educated decision about purchasing one for yourself. If you want to be even more informed and find out how to adopt a healthy Maltese puppy, learn more about toy Maltese puppies. Have you ever had a teacup Maltese dog? If so, your dog could be famous! Please tell us all about your experiences with Maltese teacup puppies and we'll put it on our website. Have you ever had one or considered getting one? If so, did you have any problems with your Maltese teacup? If you decided not to get one, tell us why. Let other Maltese Maniacs know what to expect from a teacup Maltese.